…and then the jersey number. It’s no coincidence. Whether you believe student athletes should be able to collect salaries, funds, fees or kickbacks is not relevant here. The legislation strictly pertains to would-be ‘offenders’ who solicit student athletes. The rest isn’t under consideration. The bill calls for sanctions on the person who attempts to or enters into a contract/transaction with a student athlete for a purpose that would likely (love the wording) suspend eligibility for performance, participation, or scholarships. Sure, the student athlete would still risk school and NCAA punishment, but we are talking about the legal system. Laws are supposed to be equitable and just. Essentially, the legislation would make one party of the contract more culpable than the other even though both parties are freely and voluntarily engaging in this behavior. We don’t need to enact legislation to tip the justice scales when we have consenting adults. Organizational sanctions are sufficient if this behavior is to be discouraged. The legislation effectively makes entering a contract punishable under the law (and with a $25,000 sanction and a felony on your record, no less). Something that is otherwise legal with any other human over the age of 18 in Georgia. I have looked for precedent and justification or even something remotely similar under Georgia law, but I haven’t been able to find anything. There is a lack of “legal need” for this bill. This won’t make us safer and it isn’t protecting anyone…if that’s your logic behind government as a whole. Government is reactive. Sometimes too reactive. It seems as though we try to win hearts and then influence people because the premise of a bill may not be good. If this wasn’t Georgia and our state wasn’t swarming with UGA fans, this probably wouldn’t have come about. 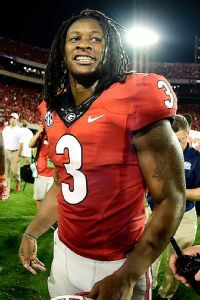 If it weren’t for the outrage over the season’s ups and downs with Todd Gurley, we may not be having this conversation. A lot of times we hear people telling us to take the person out of the politics and they’re referencing the sponsor of legislation, but I’m not exactly a fan of the heart strings bills that use poster children to disguise expanded government. Pre-filed bills are often shells, too, which will be amended later, but this one is bad in premise and I hope our legislators – and football fans -are able to see that. This entry was posted in 2015 Legislative Session, Education and tagged 2015 legislative session, Georgia general assembly, HB 3, NCAA football, Rep. Barry Fleming, Todd Gurley, University of Georgia on December 8, 2014 by Jessica Szilagyi.